We have the confirmation Advances in Electrical and Computer Engineering will be included in the EBSCO database. We have the confirmation Advances in Electrical and Computer Engineering will be included in the Gale database. IoT is a new emerging technology domain which will be used to connect all objects through the Internet for remote sensing and control. IoT uses a combination of WSN (Wireless Sensor Network), M2M (Machine to Machine), robotics, wireless networking, Internet technologies, and Smart Devices. We dedicate a special section of Issue 2/2017 to IoT. Prospective authors are asked to make the submissions for this section no later than the 31st of March 2017, placing "IoT - " before the paper title in OpenConf. Thomson Reuters published the Journal Citations Report for 2015. The JCR Impact Factor of Advances in Electrical and Computer Engineering is 0.459, and the JCR 5-Year Impact Factor is 0.442. Starting with Issue 2/2016, the article processing charge is 300 EUR for each article accepted for publication. The charge of 25 EUR per page for papers over 8 pages will not be changed. Details are available in the For authors section. Thomson Reuters published the Journal Citations Report for 2014. 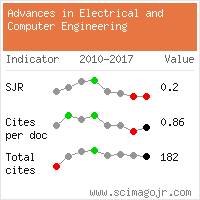 The JCR Impact Factor of Advances in Electrical and Computer Engineering is 0.529, and the JCR 5-Year Impact Factor is 0.476. Starting on the 9th of February 2015, we require all authors to identify themselves, when a submission is made, by entering their SCOPUS Author IDs, instead of the organizations, when available. This information will let us better know the publishing history of the authors and better assign the reviewers on different topics. We have more than 500 author names on the ban-list for cheating, including plagiarism, false signatures on the copyright form, false E-mail addresses and even tentative to impersonate well-known researchers in order to become a reviewer of our Journal. We maintain a full history of such incidents. In the effort to maintain accurate citation information for the papers we published and for their references, we updated the citation engine to use the most recent Elsevier API. We strive to rapidly correct all the possible problems generated by this migration. Citations and Cited-by information in SCOPUS will be silently updated in the background. In the interest of providing a secure and reliable service, effective today, we disabled support for SSLv3, following the announced POODLE Bug. Thomson Reuters published the Journal Citations Report for 2013. The JCR Impact Factor of Advances in Electrical and Computer Engineering is 0.642, and the JCR 5-Year Impact Factor is 0.580. Thomson Reuters published the Journal Citations Report for 2012. The JCR Impact Factor of Advances in Electrical and Computer Engineering is 0.552, and the JCR 5-Year Impact Factor is 0.479. In order to better and uniquely identify the authors, we publish permanent links to their profiles on Sciverse / Scopus. The information is available for all papers published after 2007. The paper template was updated with new information and instructions. No significant changes were made, but accepted papers authors' are kindly asked to follow all the editing rules. More attention should be paid to the paper title, Abstract, Keywords and References sections. Thomson Reuters published the Journal Citations Report for 2011. The JCR Impact Factor of Advances in Electrical and Computer Engineering is 0.555. We are proud to announce Professor Nathan IDA (University of Akron, USA) joined the International Scientific Board of our Journal. We also have the confirmation Advances in Electrical and Computer Engineering will be included in the ProQuest database. Thomson Reuters has recently updated the Journal Citations Report 2010 and revised the Impact Factor of Advances in Electrical and Computer Engineering from 0.688 (as of JCR published in June 2011) to 0.700. Also, the Aggregate Impact Factor for the "Computer Science, Artificial Intelligence" category was revised from 1.817 to 1.849, the Median Impact Factor remaining unchanged. Also, for the category "Engineering, Electrical & Electronic" the Aggregate Impact Factor was revised from 1.441 to 1.462, and the Median Impact Factor from 0.962 to 1.004. Starting with number 1/2012, the best top 3 accepted papers will be published free of charge. The respective papers will be selected based on the total score obtained in the reviewing phase. Thomson Reuters published the Journal Citations Report for 2010. The JCR Impact Factor of Advances in Electrical and Computer Engineering is 0.688. Starting with Issue 2/2011, the article processing charge is 200 EUR for each article accepted for publication. Details are available in the For authors section. New backup hosting location for Advances in Electrical and Computer Engineering was setup, in a different physical location. Also, a Failover mechanism is in place with DNSMadeEasy, so the AECE website will never be down, even the database connection will be limited. Advances in Electrical and Computer Engineering is now indexed and abstracted in SciVerse Scopus (by Elsevier Science), the world's largest abstract and citation database of peer-reviewed literature and quality web sources. All papers back to issue 1/2008 will also be submitted for inclusion. All static content of our web-site will be served to users from Amazon CloudFront Content Delivery Network. We moved our DNS servers to the leading Anycast IP Routing DNS provider and optimized all files in order to speed up the loading time of all pages, for a better user experience. Thomson Reuters published the Journal of Citation Reports 2009. Advances in Electrical and Computer Engineering Journal had an impact factor of 0.509 in 2009. AECE Journal will have 4 issues each year, published in February, May, August and November. Advances in Electrical and Computer Engineering Journal is now abstracted and indexed in Directory of Open Access Journals (DOAJ). For issues published after 2007 we will publish on-line the references for all published papers. Where available we include, for every reference, the CrossRef, PubMed, PermaLink, IEEEXplore or Handle permanent links toghether with the links and number of citations in ISI Web of Knowledge and SCOPUS. All Digital Object Identifiers (doi:) numbers for papers published in 2007, 2008 and 2009 were registered with Crossref and are operational now. Release of the v2 version of AECE Journal web-site. The OpenConf web interface submission system was installed. We no longer accept E-mail submissions, all prospective authors must use the online submission interface. Advances in Electrical and Computer Engineering Journal was recognized by Thomson Reuters, Institute for the Science of Information (ISI), that has recently selected our journal for coverage in Science Citation Index Expanded and Journal Citation Report. The Journal is listed in two categories: "Computer Science, Artificial Intelligence" and "Engineering, Electrical & Electronic". The first Impact Factor will be published in Journal of Citation Reports 2009. New design of Advances in Electrical and Computer Engineering official site. Advances in Electrical and Computer Engineering was rated a Class B+ publication by CNCSIS. First issue of Advances in Electrical and Computer Engineering (Print ISSN: 1582-7445 / Online ISSN: 1844-7600) has been published, replacing the Annals of the Faculty of Electrical Engineering (Print ISSN: 1222-4316), which has been published between 1990 and 2000. Website conception, design and maintenance by Eugen COCA. Content updated on 28 Feb 2019. Site engine updated on 28 Feb 2019. This page was generated on the server in 0.015 seconds and loaded in your browser in > seconds.